The tradition of the English song does not have the long history of either the French or German, but the last five centuries of song making have been one of the prime glories of the English repertoire. The genre has evolved through the ages, from the lute songs of the Tudor period to the 20th century composers such as Britten, Tippett, Bridge, Finzi and Quilter. The programme contained on these two discs covers 250 years of superb song making, from the reign of Henry VIII to that of George III and among the 26 composers who make up this enthralling programme one finds such celebrities as Byrd, Dowland, Gibbons, Lawes, Purcell, Boyce, Dibdin and Eccles. Both texts and music cover a wide range of feelings and emotions, and one is left in no doubt as to the immense contribution of these English masters to the European song tradition in general. Sponsored by the now defunct British Council way back in 1976, the recordings are highly acceptable although some minor blips in the first CD are detectable. Both performers and singers are some of the finest at the time, and the listener is regaled by some truly sumptuous renditions. 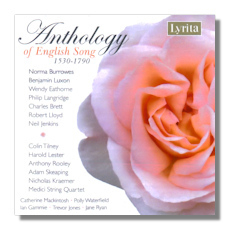 This release is an invaluable addition to the ever expanding Lyrita discography of England's musical gold.